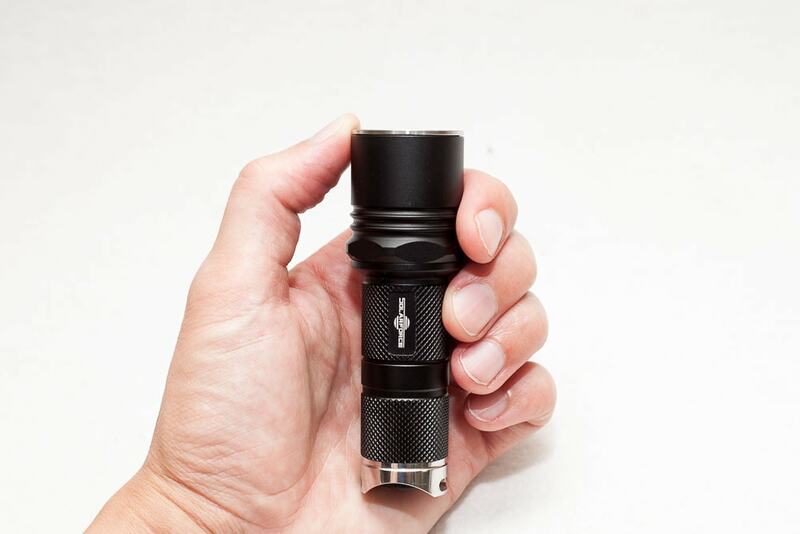 Solarforce L2M mini review | Awesome little light and lego-able. You like to keeping things to a minimum? I'm not talking about less usefulness, I'm talking about less flashlights that aren't being used. Then the Solarforce L2M should be on your research list. 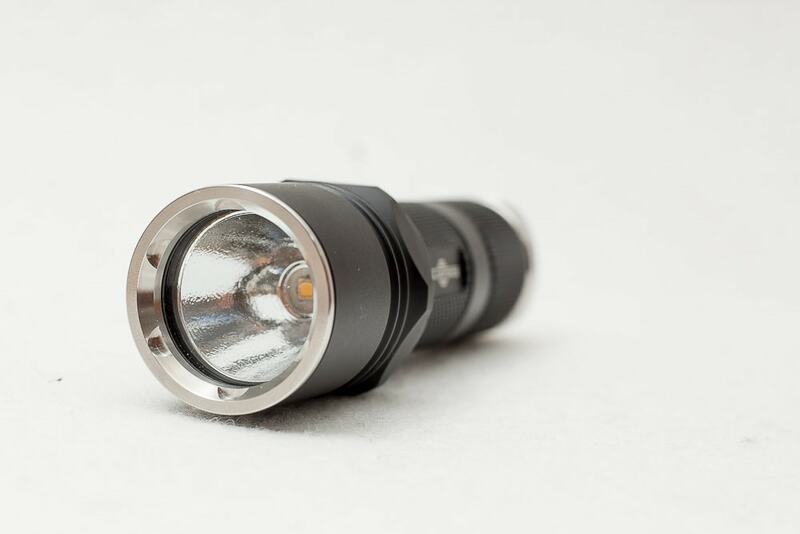 This is still a nice flashlight although many people think its obsolete. But I'd like to share my ideas and experience with Solarforce flashlights that use P60 drop-ins, in order to help you reconsider getting one of these toys. Let's dive into the mini review. This is my 3rd or 4th Solarforce flashlight. My very first one I still have around, which is the L2i.. which has been out of production for a very long time, probably 5-6 years.. 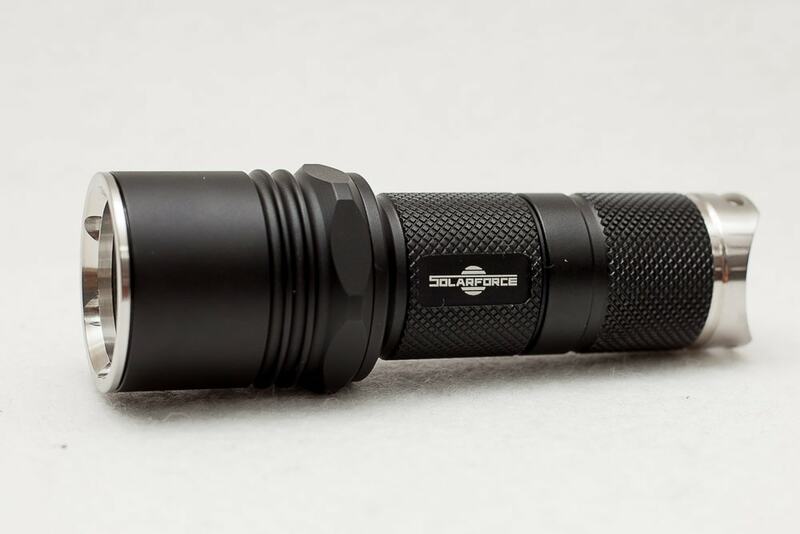 The Solarforce flashlights are made of very decent quality. And are still an excellent choice in my opinion. 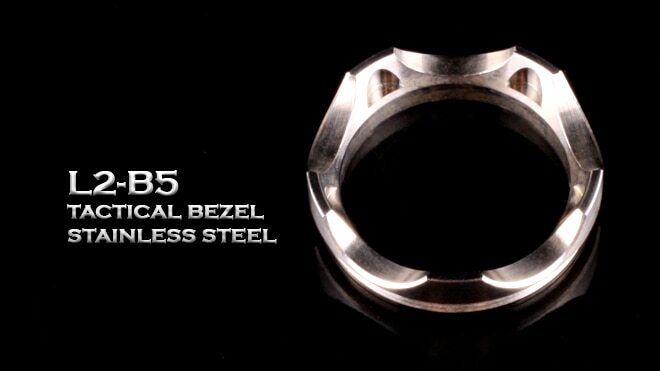 The L2m I own has a few special things to it, a shiny stainless steel bezel and a special tailcap. You can mix and match the different parts of the light.... more on that later. 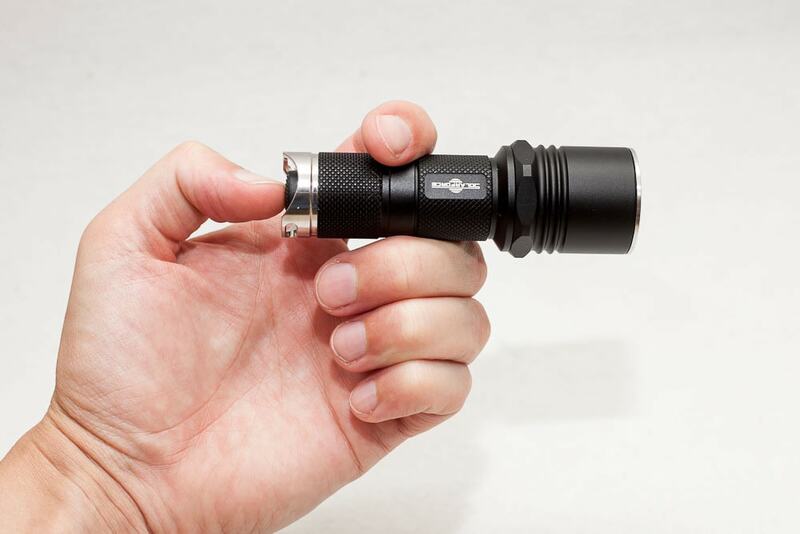 The L2m with the shortest body tube holds nicely in 1 hand and is comfortable to hold. Yes, no problem even with the tailcap I am using. 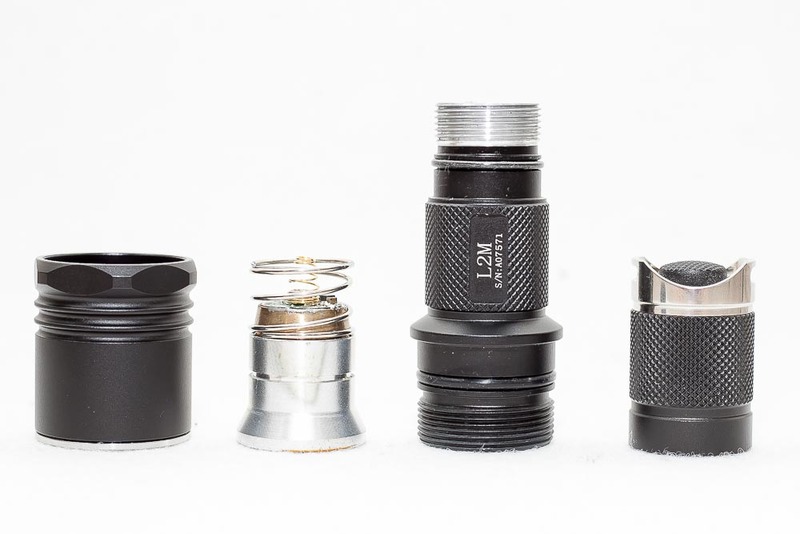 Anodization is the coating of a flashlight. The quality of anodisation of Solarforce is nothing to complain about. Not sure how much worse or better it is from other brands, but I feel like they are a little more sensitive and easy to get damaged. The L2m came in good condition though. The build quality is good. The pictures don't show the extended battery tube in order to use 18650 batteries, but you can see in the pictures that the L2M is not bad at all. Nothing is glued or whatnot. Since I own the L2m for a few years (and almost never used it) I don't remember if the threads came lubed, but its easy to do it yourself. 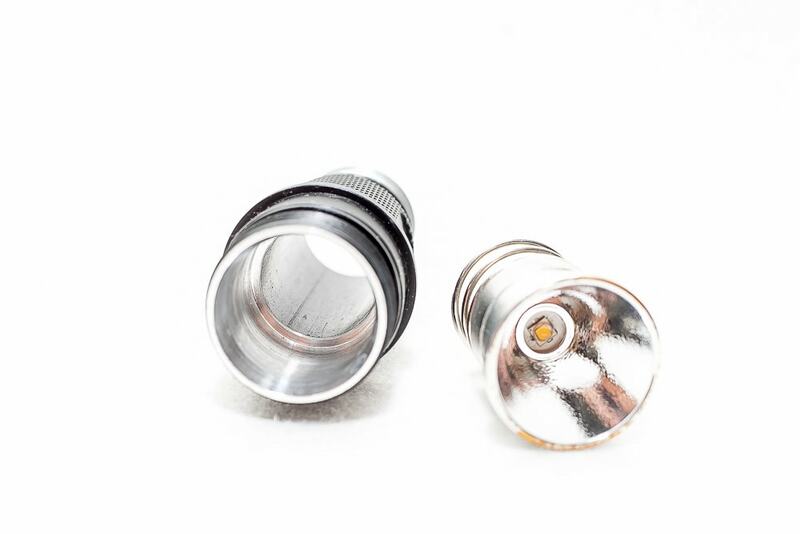 The threads towards the tailcap are unanodized. 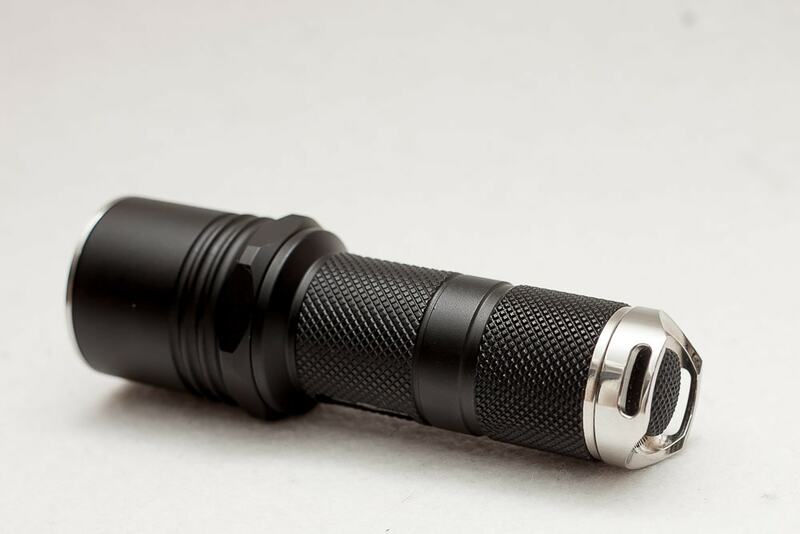 This makes the threads a bit grittier than most other flashlights these days who have mostly anodized threads. This is the coolest part of the Solarforce family. You can LEGO them, so you can exchange parts from one model to the other. 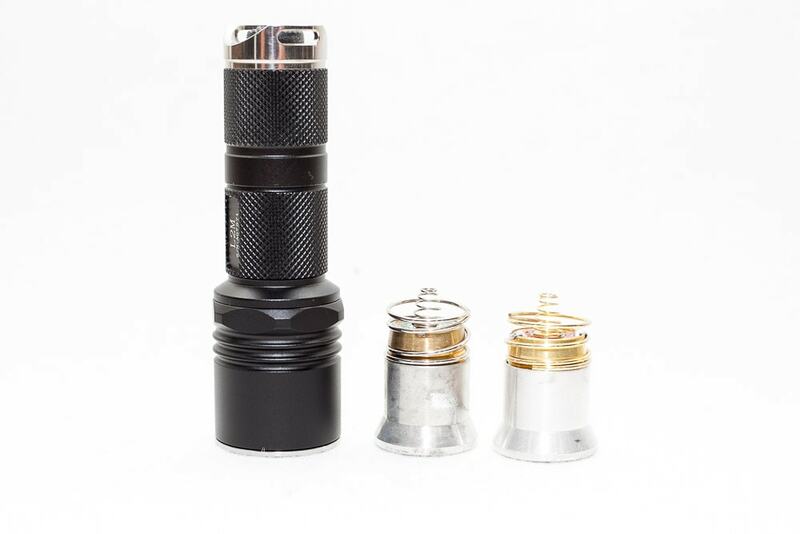 You can get all kinds of accessories, like different bezels, a different head, different reflectors, different LED, different tailcaps, a forward clicky switch, a reverse clickly switch, carry clips etc. In the pictures below you can see the original bezel, and the stainless steel one. The P60 dropin I use have not so much power though, but enough for most purposes, especially indoors. The reflector is slightly OP (orange peel). But you can get ANY type you want, OP, LOP, Smooth etc. Anything you wish. 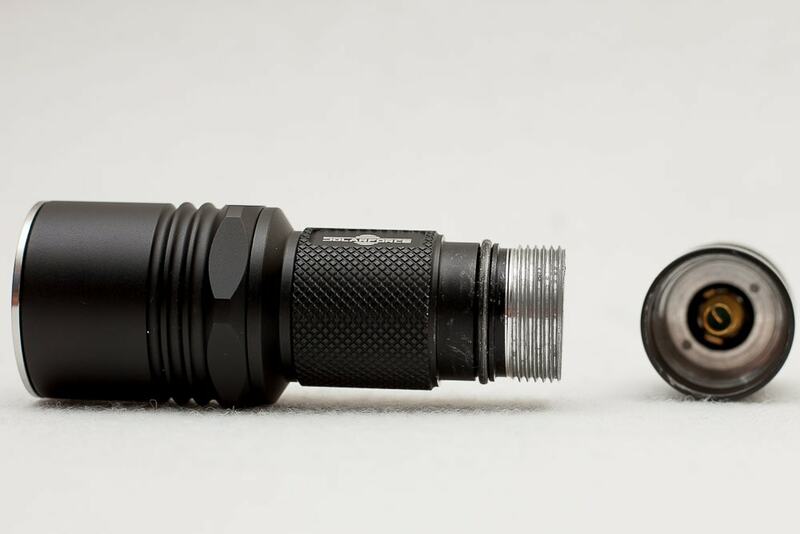 This means that it's not a very small flashlight like some of the EDC's that use 18350 batteries. But it's a nice one to have anyhow. Just as I said above, you can change the dropin with a double extender so you can use 2*18650 for example. So it's definitely not the smalles one out there that runs off 18350 batteries. And compared to some 18650 type lights, it's quite bulky. 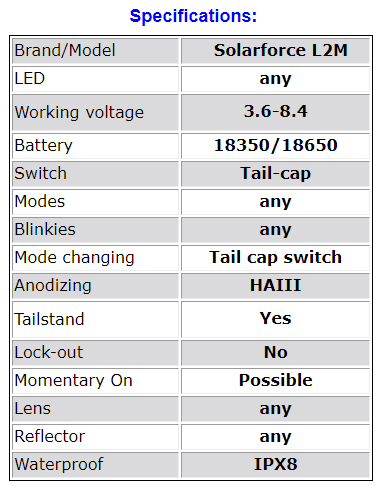 See below for a comparison between the Convoy S2+ and the Solarforce L2M. And on the left you have the Reylight Titanium Triple. The first version. And on the right you can see the P60 dropins. Again, this is one of the things you can completely control. Some of the more flashaholic style sellers (unlike the big online chinese stores) let you choose the User Interface. And you can even flash the drivers yourself and have the exact User Interface you want! That is what I have done with this L2M and my L2i. I don't flash my drivers anymore, but these have a simple 4 mode setting, ultra low, low, medium high. And no memory, so they always start on low.. extremely useful in the kids' bedrooms. Yes and No.. It depends on the driver that the P60 has installed. You can flash it yourself in order to use it with Momentary On, but you also need a Forward Clicky then to make it easier. This is not necessary, because it has a mechanical switch that draws no energy! Depends on the driver that was provided with the Dropin! This is probably the reason why these type of lights are not popular anymore. Ever since we learned that you can get better use copper MCPCB's (led boards) flashlight have been getting brighter and brighter, and 1 of the negative things of a P60 flashlight, is that the heat transfer is not optimal between the P60 drop in and the body. This results in a drop in output quite quickly because the heat built up lowers the output of the LED. 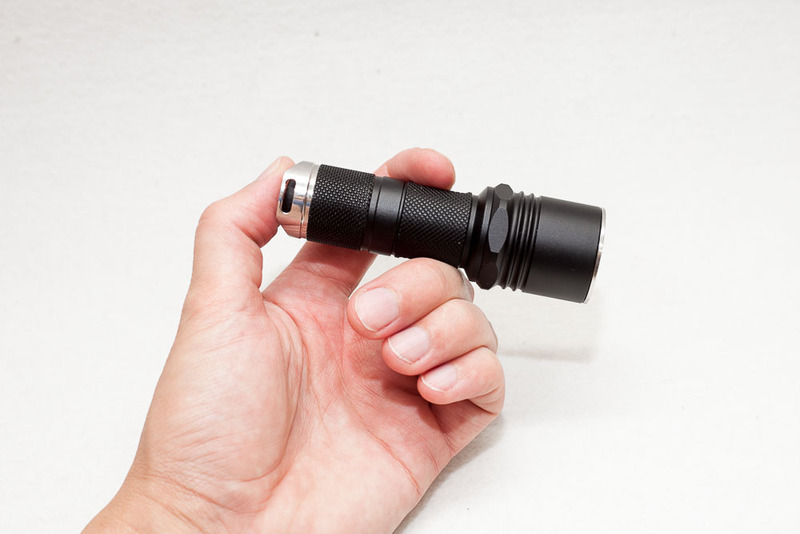 Other flashlights don't have this as much and have a much better heat transfer. TRICK: you can use aluminum or copper tape to put around the reflector and have better heattransfer. More expensive and top-notch P60 dropins have a good chunk of copper as their base/pill so they can transfer heat much better, away from the LED. Dont expect anything extraordinary here. 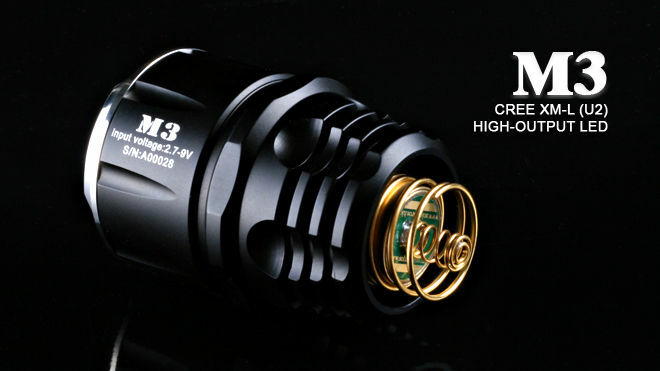 It depends on the Led that is being used, the reflector and the the type of head. The original head doesnt allow a wide reflector so you can't do anything about it, unless you buy a M3 head. Unfortunately the M3 heads are not available anymore! You can have multiple kinds of dropins, like UV, Red LED, Blue LED, Infra Red, Cool White, Neutral White etc.. and have only 1 body. You can have what you want. Easy upgradeable and that for a very good price. You want a newer LED, just get a new drop in. It's also not so difficult to change the driver by yourself, or the LED if you want to learn how to solder. 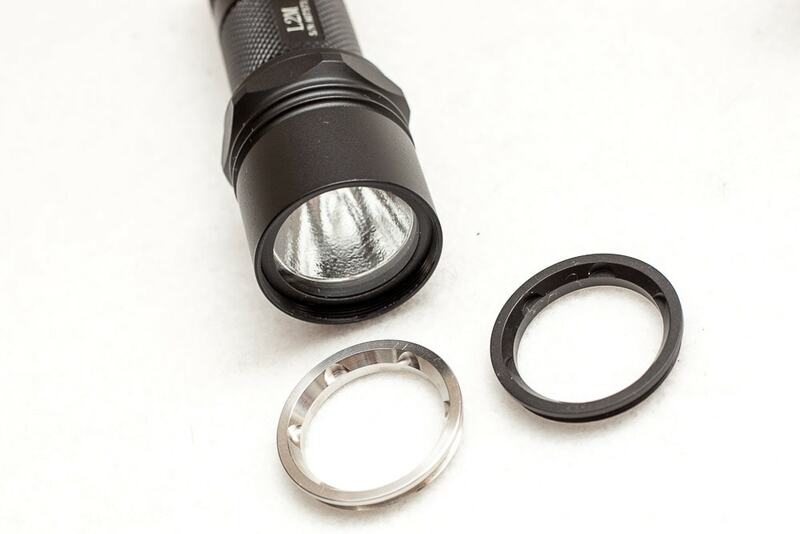 If you aren't very good at soldering, just get a new P60 for 10-20 USD, and you can still use your favorite body and parts without having to buy yet another flashlight. You can buy them at the Solarforce store.